Staging of gastro-oesophageal cancer is crucial not only in deciding upon the management options but it can also decrease the number of non-curative laparotomies. Therefore it has been an area of much research and controversy. The current practices for gasto-oesophageal cancer staging prevalent among upper GI surgeons in United Kingdom were sought. We conducted a survey by handing out structured questionnaires to Upper GI surgeons attending a national conference of Association of Upper Gastro-Intestinal Surgeons in UK. CT scan was the most commonly used investigation in the staging of all upper GI cancers (100%). Peritoneal cytology was the least widely used investigation among the surgeons. Further are illustrated in the table. 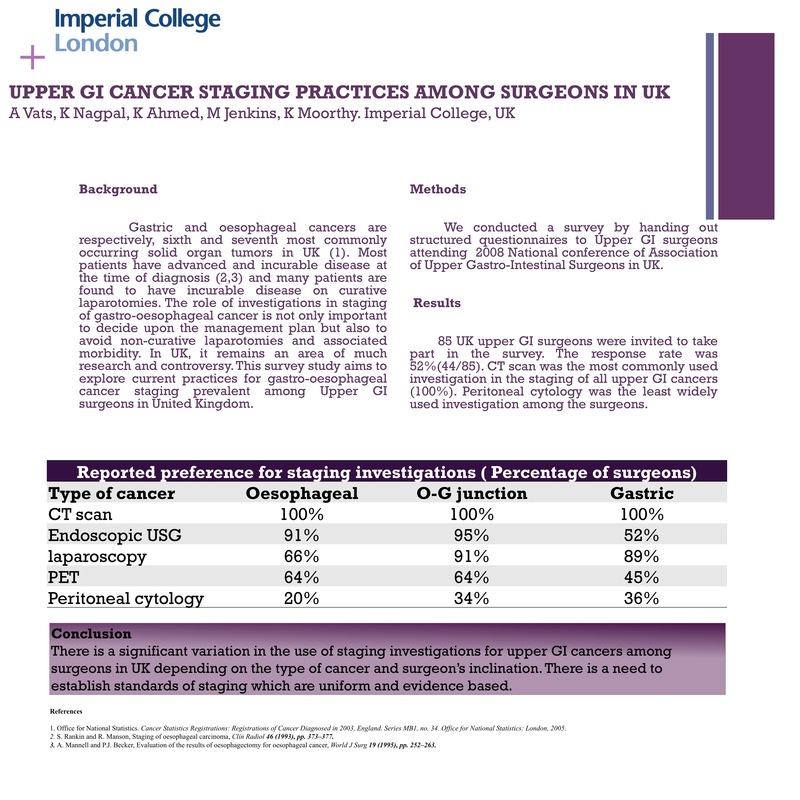 There is a significant variation in the use of staging investigations for upper GI cancers among surgeons across UK. The investigations used not only depend upon the type of cancer but also the surgeon preferences. Therefore, further research is needed to establish a standard staging practices.